When visiting China, visiting the national symbol is a must! The Panda Bear is known worldwide by its distinct features. Unfortunately it is driven to extinsion, but with the help of the Panda Research Center in Chengdu there is hope. With a good functioning breeding program and 50 Giant Panda's plus 20 Red Panda's strolling around. Dearly note that it is not a zoo. The animals are not on display and are not very active throughout the whole day. It is preferred to visit the park before 10:00 AM there the Panda bears are mostly active during the morning when they eat. We arrived a bit later around 12:00 PM but were fortunate to see a lot of active Panda's on the sight. Make sure you be there before 14:00 PM, else you might be stumbeling upon a lot of empty or inactive Panda resorts. There are numerous interactive sights which teach you all the ins and outs of the Panda bear. It is a research center after all! ;-) The Chinese government is trying to make visitors aware of the endangered situation the Panda bears are in . By promoting public awareness the government hopes to help save the species from becoming extinct. The whole research center is also filled with Panda props, with the famous Kung Fu Panda movie character being everywhere. Be sure to take a cool picture! 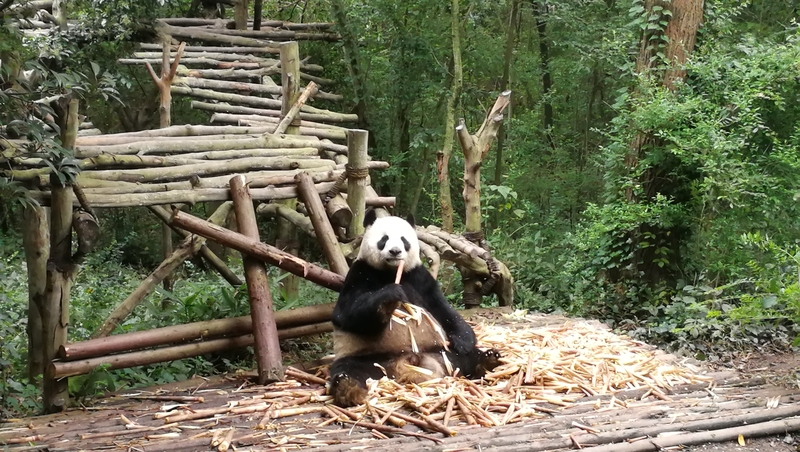 :) And of course everything is surrounded by bamboo, the Panda's favorite treat! Hey @Travelboost, we went by train from Chengdu to Leshan. Used the Uber variaty China has to get to the Panda park, but there are also public busses taking you there. Yes, both are doable on one day. We did the same! Thank you for such an insightful post! I'm hoping to visit Chengdu this summer, can you recommend the best route to get there by public transport? Particularly any buses that are running early in the morning :) Also, do you think it is feasible to visit both the pandas (early morning) and the Leshan giant buddha in the same day? Thanks!